Whether you like Megadeth or not, this is one seriously impressive metal guitar. DiMarzio CB 6 'buckers sound brilliant. Clever, fun tweaks to the electronics. Highly playable Soloist neck. Tone control not terribly useful (even when engaged). Megadeth's 2008 recruit and axeman extraordinaire Chris Broderick landed his own signature model back in 2012 - but with the Jackson Chris Broderick Soloist 6's current street prices of over £4k, it's a case of, 'Who's buying?' Praise the lords of shred, then, for the Pro Series Soloist 6. Broderick's latest sig boasts all the key plugged-in specs of his high-end model, with the same DiMarzio pickups and switching options as its big bro. Sure, at a quarter of the price, there are some compromises. 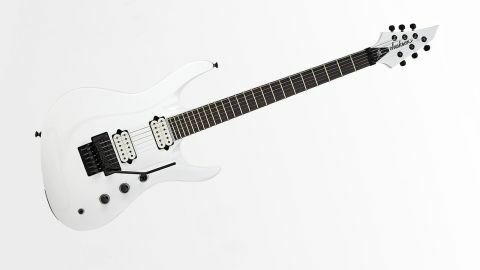 "Don't let the three-a-side headstock fool you: playability is in the classic speedy Soloist vein"
You lose the maple top, leaving slightly lacklustre Snow White and Satin Black finishes, and the German-made Floyd Rose Pro vibrato is replaced with a Korean-made Floyd Rose Special, but that matters not: for the price, this is still a seriously well-equipped shred guitar. The unusual strap-button placement is designed to keep the neck at a comfortable angle, allowing you to appreciate the slender matt polyester-finished through-neck and its 24 huge frets. Don't let the three-a-side headstock fool you: playability is in the classic speedy Soloist vein, and we appreciate the upper-fret access-enhancing body carves around the top end of the fingerboard, too. The most exciting part of Broderick's behemoth lies in the electrics. While the volume knob conceals a push/pull coil-split for the two CB 6 humbuckers (Broderick's take on DiMarzio's D Activator in the bridge and PAF Pro in the neck), the tone control does nothing in the standard position. You'll find that tugging on the control engages its usual function, although there seems to be little tonal benefit to having it activated or not. The real fun starts when you get the lower body-located killswitch involved, which you can combine with the supple Floyd for Tom Morello-esque noise antics. But forget the neck, the vibrato and the switching; it's the DiMarzios' tones that put Broderick's offering ahead of other shred axes, with a boisterous midrange and sweet top-end, which ensures they're as at home with crunched-up chords as crushing Megadeth thrash. They're still high-gain, but not as aggressive as a set of active EMGs, which is good news for clean tones - plus the coil-split sounds are among the best we've heard from a 'bucker-loaded guitar. There's a lot of competition at this price point, but we reckon the flexibility of tones might just give Broderick's Jackson the edge for guitarists who play more than just metal.